At Saint-Gobain Surface Conditioning we are problem solvers: we are committed to working in close collaboration with you to co-develop custom solutions to your most demanding surface finishing challenges. By combining our formulation knowledge and our deep material science expertise, we transform raw materials such as diamond, alumina, zirconia and base chemicals into precision-engineered particles, compounds and slurries that optimize surface conditioning processes in a variety of industries. 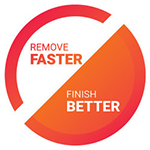 With a focus on applications ranging from automotive polishing and hard crystals polishing to chemical mechanical planarization and hard disk drive, Saint-Gobain Surface Conditioning’s ultimate goal is to enable you to remove material faster while making your surface finishes better. At our state-of-the-art R&D and application centers, Saint-Gobain Surface Conditioning applies our advanced analytical capabilities to test particles and chemistries. In our application lab, we’ll replicate your process to troubleshoot problems and develop new solutions. Saint-Gobain Surface Conditioning is present in the U.S., Europe and Asia through our global network of manufacturing sites and research and development centers. Our worldwide sales team is committed to delivering unparalleled service and technical support. At our ISO certified manufacturing plants, we provide 100% inspection of all incoming raw materials and finished products, as well as full traceability. We pay strict attention to raw material synthesis, sourcing and processing, so you can be assured of environmentally friendly products that offer repeatable quality and consistent results. Saint-Gobain Surface Conditioning includes four product brands that are recognized around the world for outstanding performance. Saint-Gobain Surface Conditioning is a member of Saint-Gobain’s Specialty Grains and Powders division, an innovative suite of synergistic businesses consisting of Abrasive Grains, Boron Nitride, Coating Solutions and ZirPro. Saint-Gobain designs, manufactures and distributes materials and solutions that are key ingredients in the well-being of each of us and the future of all. They can be found everywhere in our living places and our daily life: in buildings, transportation, infrastructure, and in many industrial applications. They provide comfort, performance and safety while addressing the challenges of sustainable construction, resource efficiency and climate change. With 2015 sales of $43.9 billion, Saint-Gobain operates in 66 countries with more than 170,000 employees.